An $800-million arts centre could transform the core. It’s Canada Day, 2017. The country celebrates its 150th birthday. The Winter Garden, which borders the new arena, is hosting a party. And, the Galleria, the heart of the new four-block-wide arts neighbourhood, is filled with revellers who are there for a number of plays and dance recitals. Downtown is once again the place to be. The sidewalks are packed with pedestrians checking out the shops. Cafes and patios are filled with families. Those walking in the Galleria can look in on shows happening at the adjoining theatres through the glass walls. A large screen drops, and passersby stop to watch a film. It’s an $800-million dream; and Irv and Dianne Kipnes want to make it a reality. The developers and liquor-chain giants want the Downtown Academic and Cultural Centre to be their lasting legacy for the City of Edmonton. The scope of the project? An estimated 650,000 square feet of space for the University of Alberta’s new downtown campus along with 300,000 to 400,000 square feet of office space and another 300,000 to 400,000 square feet of theatres. It is one of the most ambitious, city-transforming projects Edmonton has ever seen – and it’s slated to be the arena’s next-door neighbour. The project is budgeted to be self-sufficient. While the aim is to offer affordable performance and rehearsal spaces to larger groups like the Edmonton Opera and Alberta Ballet, it is also designed to give smaller theatre, dance and music companies the space they need to flourish. Irv says the maintenance model is simple. Funds raised through the university’s lease and the use of the office space will then be funnelled back to the theatres and arts spaces, which will lower the costs for thespians, dancers and musicians to use the stages. City Council voted July 3 to endorse the project, and agreed to a framework to fund the plan. But that framework indicated federal and provincial contributions that were to be determined and the city’s portion wasn’t finalized. With plenty of space for restaurants, cafs and shops, the vision is to make the Centre a legitimate arts district, to keep people downtown before and after the shows. That “whole” involves the University of Alberta. Arts students would move downtown, and the Centre would offer them plenty of rehearsal space. A yet-to-be-named non-arts faculty would also move from the south side to the new downtown campus. In the deal, the School of Music gets a performing theatre since the U of A gets 50 per cent usage of a new 650-seat theatre. As well, the project calls for a new 1,650-seat theatre for the Alberta Ballet and Edmonton Opera. And the key is a shock-absorbing sprung floor, designed for dancers, an expensive feature that no Edmonton theatre has at the moment. Just how costly? Right now, in Los Angeles, the Silverlake Contemporary Ballet is looking to raise $24,000 for a sprung floor. But, how does Edmonton’s Jubilee Auditorium – the current home of the Opera and the Ballet – feel about a new project that would lure away its core tenants? Katherine Huising, former director of the Jubilee, says that a new facility will be good for the city. “I think there will be continued demand for space as Alberta and Edmonton continue to grow,” she says. “If you look at the growth of the city, there will be an increased need for alternative space. It will still take a few years for this project to be completed, so this project is seen as a forward-looking. Dianne Kipnes says the Jubilee, which has a capacity of 2,515, is simply too big for most local arts groups. Before going public with their plans, Irv and Dianne approached AMS Planning and Research, a U.S.-based arts consultant, to perform a feasibility study. AMS interviewed almost 70 Edmonton theatre groups – and, in its report back to the Kipneses, it stated that ticket subscriptions would rise by 25 per cent overall if many of the troupes could be centralized in a neighbourhood created especially for the arts. Dianne says the Centre will give many of the arts groups more exposure – it will allow them to reach people outside the usual suspects of theatre and dance fans who simply renew their subscriptions every year. And the Galleria is the centrepiece to it all. 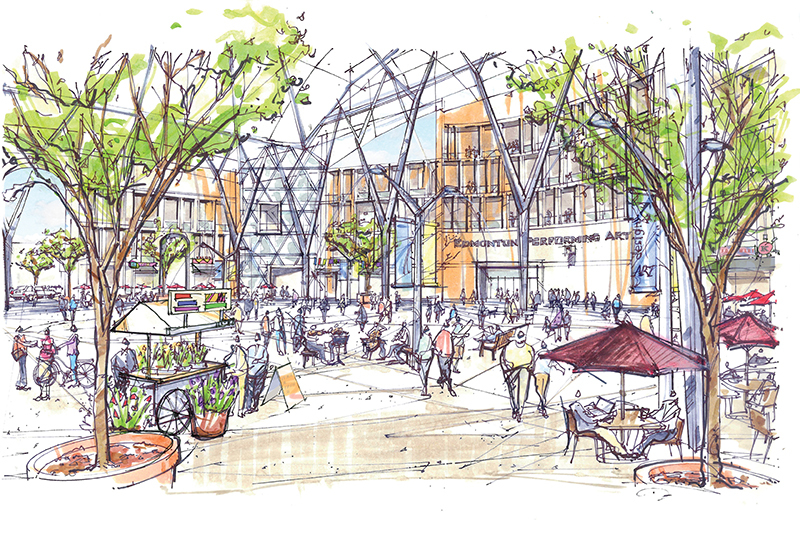 The glass, domed courtyard will house restaurants, cafes and shops, which could be open 12 months of the year. The dome wouldn’t extend all the way to the ground, so the Galleria would still have some feeling of being an open-air venue. It could be used for a special event, such as a New Year’s Eve countdown. Entrances to the theatres will face the Galleria, and one theatre will have three glass walls so people from the courtyard can look in. Dianne says that it’s not enough to just have the theatres. You need to have restaurants where people go to eat before or after shows. Downtown Edmonton should be a place where friends stay all evening long, not just arrive by car or LRT for a show, and then leave right afterwards. Irv’s selling point is that it’s a one-time buy-in and once the project is done, it is designed to be self-sufficient. But the majority of the funds would be financed; interest rates are at record lows, so borrowing money isn’t expensive at the moment. That would represent a new model, as theatre and dance troupes are often dependent on grants from various levels of government in order to stage the events. The Kipnes model would help groups move to more stable forms of funding. One thing is true about governmental support: It changes as regimes change, and it always leaves the arts groups on pins and needles. The Kipneses are well-known for their philanthropy through their foundation. Irv is 77 and he’s been feted for the work he’s done raising funds for the Cross Cancer Institute, University Hospital and the Mazankowski Heart Institute. It’s clear that the Downtown Academic and Cultural Centre is the jewel in the crown. And, he and Dianne are sure that if they build it, people will come.